So it makes sense that I felt distracted while attempting to work last week. I missed my precious baby granddaughter (and her parents) while I dealt with Irma issues. Even so, I’m usually better able to tune out distractions while polishing prose — whether my clients’ or my own. In a handful of days I would complete my seventh year as a widow. I once again faced the anniversary of my husband’s unexpected death. That the date snuck up on me felt like a victory of sorts. This year, I’d finally functioned (reasonably well) through the early days of September. Mild distraction — easily attributed to gratitude and gladness over becoming a grandmother as well as the harried hurry of hurricane hassles — proved a gazillion times better than the overarching, insurmountable, emotional maelstroms of previous Septembers. I remember the acute pain of new, raw grief: Loss hollowed my gut and battered my brain. Sleep channeled nightmares instead of rest, and waking meant the worst nightmare was real. Simple, familiar tasks required impossible concentration and dexterity. Memory melted. I couldn’t eat. Couldn’t think. Didn’t want to exist. People tried to rush me through the grief. “Don’t worry. You’ll feel better in time.” But in that new grief I didn’t need to be told my life-changing loss didn’t matter. The best consolation came from those whose honesty acknowledged my life would never be the same. I needed to hear that the devastation I felt made sense. Then I asked the naive question only someone desperate not to feel so awful will plead: How long? How long will this grief tear me up? How long until I feel like myself again? Their experienced, widowed answers varied, but they ran along similar, appalling, prophetic lines: Three years. Five years. Seven years. It seemed impossible to survive with grief’s ache for three hours at at time, much less three years. But their frankness assured me it was okay that I didn’t “bounce back” right away (despite other folks’ well-meaning, ill-informed attempts to urge me to “get over” my mourning). Time and experience certified their counsel as reliable. Starting over takes time — emotionally, physically, financially, socially — and learning to live onward after the death of a loved one requires starting over. At my husband’s three- and five-year angelversaries, I knew I still had a long way to go, but I could see how much progress I’d also made. Now, heading into the completion of year seven and the beginning of year eight, I more than see that progress — I feel it. No doubt there will be setbacks. Life and love and grief are built that way. But today … today I’m feeling fine. And that’s a good sign. What should you say to someone who is grieving the anniversary of a death that happened a year ago? What about two years? There’s never really a “good” time of year for someone to die, but the timing of any death can be hard on those left behind. Not just in the immediate days and months after the loss, but in the years ahead as well. Anniversaries of death (and other occasions) can make “old” grief feel newly raw again. There’s no time limit on how long a friend will grieve. For the last week I’ve heard lyrics proclaiming “death and darkness gather all around me.“(*See below.) I’m not living my life in gloomy obsession, but I can’t help but feel compassionate awareness. Too many friends (and family) have lost loved ones around this pre-Valentine’s Day time of year. These couple of weeks in my calendar mark days of deep significance — and mourning — to friends and family: Death and/or funeral dates of friends’ children, friends’ friends, and friend’s spouses. 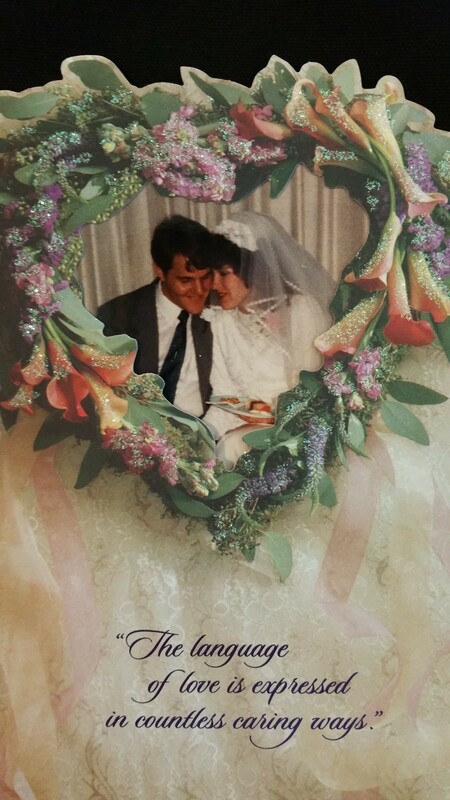 Wedding anniversaries of now-widowed half-couples. The day a friend’s beloved pet died. It’s not only my friends whose grief is reinforced during this part of the calendar. These same weeks include the “angelversary” dates for my father-in-law and for one great-aunt. 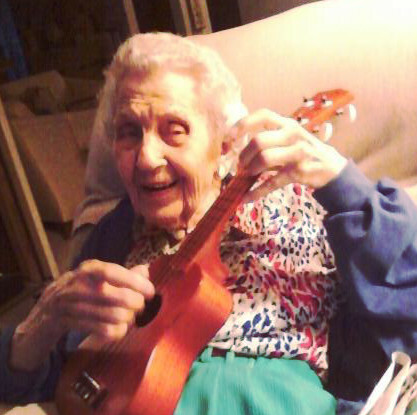 At nearly 95 last year, Aunt Ginny was still eager to try something new. Last night, when I drafted this post and went to bed to sleep on it, the next line I wrote described that great-aunt’s sister, “another beloved great-aunt whose nearly ten decades appear to be … slowing.” When I woke up I learned my sweet Aunt Ginny passed in the early hours this morning. Part of me rejoices for the reunion she’s having with her parents and siblings and my mom and my husband! For her sake, I’m relieved her fragile, increasingly confused, and recently fractured nearly 96-year-old body isn’t hurting. But for me and for all of our family, and for all who knew her, having her gone — actually gone — leaves a painful, gaping hole of mourning. The next words I wrote last night (immediately below) seem even more appropriate in the light of today’s sadness. 1. Remember that grief is a by-product of love. Mourners have the right to grieve in their own ways and times. Grief doesn’t just “go away,” nor is it to be “gotten over.” Rather, it must be worked through, often over the course of a lifetime. Be patient and accepting of your friend’s grief. 2. Acknowledge the loss. Speaking the loved one’s name shows they aren’t forgotten. Their survivors need to know they aren’t the only ones who miss the deceased. 3. Listen — without curtailing or dismissing emotional outbursts or nostalgic reflections about dead loved ones. Ask if the bereaved would like to share stories of their loved ones. Ask if they’d like to hear your stories of their loved ones. After Mom died I hesitated over whether to acknowledge her birthday — or their anniversary — to Dad. I say “hesitated,” but that’s too mild a word. What if … he didn’t remember their anniversary ? What if … he didn’t remember it was her birthday? What if … he’d forgotten his sadness … and I reminded him? What if I made him feel worse? I didn’t know then, even though I missed her terribly, too, that my widower Dad missed her so much more. He was already sad — of course he was — already grieving her absence. The week of her birthday felt awful, though my husband did his best to help me through it. Then one of Mom’s friends brought me a loaf of homemade bread. She knew it was Mom’s birthday, and she told me about a time when my mother took some to her. Knowing someone else remembered my mother meant everything! Even so, I still hesitated to bring up special Mom-related occasions around Dad because, again I thought, What if I make him feel sad by mentioning her? After my husband died, I realized how ridiculous my thinking had been. Even though I’d wanted and needed acknowledgment of others’ ongoing thoughts of Mom, I’d assumed Dad could “forget” the timing of significant dates. I’d assumed that by mentioning those special occasions I’d “make” him feel more sorrow and longing for her than he already did. As a widow it felt even more important and helpful to have people remember — and acknowledge — my husband’s birthday than my mom’s, though I still wanted that, too. Before hubby’s death, he was the one who helped me get through Mom’s birthday, the day after his. Their birthdays fell in the fourth month after his death. Shock had begun to lift, but I was still, frankly, a mess. In that first year, one of my best friends flew 2,000 miles to spend that difficult week with me. She returned again for the week of the anniversary of his death. Her presence made a world of difference! Another thoughtful woman gave me a card a few days before that same first “angelversary,” as some call it. (Some also call it the “sadiversary.” When my grief was still raw I called it the latter; now tempered by a few years, I think of it as the former.) In her sweet note she acknowledged awareness that it was a difficult time of year for me. Until then I’d known her only as a friendly acquaintance, but we’d not been particularly close. Her thoughtfulness marked the beginning of a now solid friendship. Don’t be afraid to “say something” to your coworkers, friends, classmates, or relatives who’ve suffered a loss. Even if your kind acknowledgment elicits a tear or two (or an entire stream), you won’t “cause” the bereaved to feel sad — their losses did that! — but you will have demonstrated you care by showing you remember their lost loved ones.